I’m trying to teach my 4 year old how to skate. A skating frame has been invaluable in allowing him to have some enjoyment between the falls. Since I won’t pay $89.95 for one in the stores I decided to build my own. YouTube has one great video which describes it all. If you have the pipe bender the pipe will just cost you about $10. Then a few minutes later you have a very usable skate frame. I had a plan to build a harvest table out of reclaimed wood for a few years and it finally jolted into action last spring when I was fortunate to be given some old barn beams from a relative (see them on my driveway in the photos). The first step was to get the beams milled into boards and I found a Mennonite guy who is willing to do that kind of work – most mills are worried about nails in reclaimed wood. My father is a former high school shop teacher and he helped me design and build the table. Working awkwardly in my basement, we laminated (glued) the boards together to form the basis for the tabletop. That was as far as we could get without a proper shop to work in. It was at this point that I heard about DIYode and it was perfect timing because they had just opened the woodshop. We spent a couple of days working in the DIYode shop and had access to all of the tools – and space! – we needed to get the job done. See photos for some of the work in progress and the finished product. Dad – We went to Diyode again this week. 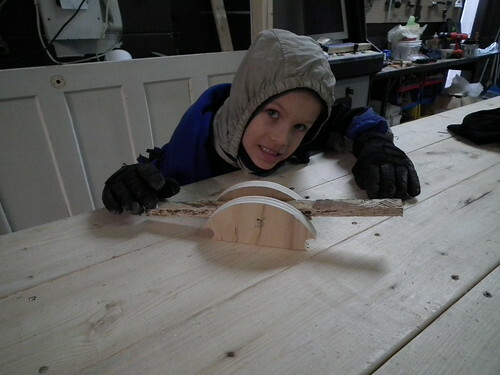 We worked a little bit on the pedal car, and we made some shelves, and then Ethan decided to make a toy teeter-totter. Ethan – This is a video of how we made it. I spent the weekend at Diyode creating a Kitchen Tower for our 16 month-old. Coraline loves helping in the kitchen, but has been falling off the kitchen chair a little too often. Our solution was this, a tower that she could climb into herself, and stand comfortably in while mixing ingredients, scrambling eggs, or pilfering keilbossa. The major cuts were made on the table saw, and using a circular saw, curves were cut with the band saw with a extension table, and inner curves cut with a jigsaw. Corners were rounded with the router, then sanded, varnished and sanded again. The space available at Diyode made this project far far easier than it would have been otherwise.